from 360 pcs. 0,19 EUR ea. Bestseller: More than 11 million sold! The convenient solution, if you want to glue on the S-10-01-N. 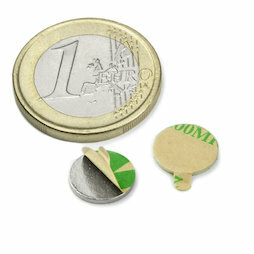 This is a flat disc magnet (10 mm diameter, 1 mm thick) with a self-adhesive side. Just remove the film and glue it on. With this magnet, every surface can be turned into a memo board and pictures can be hung up everywhere without making holes. If you order 20 pieces, you receive 10 magnet pairs! A plastic strip separates the magnetic pairs and makes the handling easier. One sales unit contains a strip of 10 pairs, meaning 20 single magnets. If you order 20 pieces in the shop, you receive a strip like the one in the picture. Please note that the magnets are in alternative order, so they are not attracting each other. That means, north and south pole alternate if you peel off the magnets one after the other from the strip. This is only relevant when it's important which magnetic pole to glue on. What can you do with these self-adhesive magnets? Let's say, you want to close a mailing or an invitation in an original way. Glue one magnet onto one side. Then you can take off the protective film and press the magnets onto the latch of the mailing. The two sides "magically" stick together and can be repeatedly opened and closed. Please note that you cannot send such a mailing directly through the postal service, because the magnets would stick to all sorts of metallic surfaces. Even a paper envelope does not do much good - the magnets should be several millimeters apart from the surrounding packaging in order to avoid problems during transport. If the box will be in use over a longer period of time, it is recommended not to use adhesive magnets and to incorporate these directly into the packaging, like in the example above. Here, the magnets are glued between the cardboard and a layer of paper. This way it can be avoided that the magnets splinter or break after some time. Neodymium magnets are brittle and therefore not suitable for repeated clashing.